Finding the right investment advisor requires asking the right questions. 3. How Do I Know Which Stock or Mutual Fund to Invest In? With hundreds, perhaps even thousands, of investment advisors working in your area, choosing one might seem awfully daunting. If you have little or no investment knowledge and if no one can refer you to someone they trust, you will have to start your search from scratch. Some groundwork and asking the right questions can lead to the right person to help you set up a worthwhile financial plan. Go to the Financial Planning Association website (see Resources section). Select "Find a planner," then select "Search for financial planners." Enter your city and state, and click "Go." You will see a listing of financial planners in your area. Look for listings of well-known investment firms. Ameriprise Financial Services, Empire Asset Management Group, Fidelity, Edward Jones, John Hancock Mutual, Merrill Lynch, Morgan Stanley or Raymond James are examples. Large investment firms have many financial planners on staff, and they will be more able to provide someone suited to your needs and profile. Write down the names and phone numbers for at least five listings. Write down information about yourself. A financial advisor will need to know your age and gender, your occupation and income, your current portfolio, your investment knowledge, and how much you want to invest and for how long. Also be prepared to discuss the degree to which you would like to be exposed to the stock market. Write down pertinent questions to ask each potential financial advisor. For example, you should ask what products and services she offers. Look for diversity, such as many products offering a variety of investments, not only stock mutual funds. Plan to ask her about her credentials. Advisors who have achieved the Certified Financial Planner designation, or CFP, have had rigorous training and passed numerous examinations. You'll also ask whether the advisor is paid through fees or commissions. A consultation with a commission-based advisor will cost you nothing, as she is paid upon a sale. If she's confident and doesn't pressure you, that indicates she's successful and not living from one sales commission to the next. And you should ask for references from other clients. 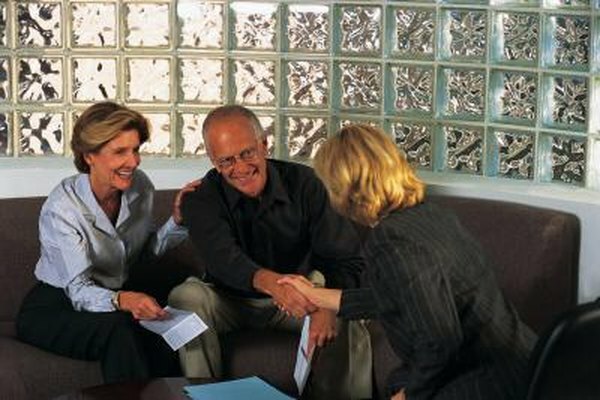 Testimonials can show whether the advisor has a good reputation. Start calling the phone numbers on your list. Tell the receptionist your name and why you are calling. You might be put through directly to an advisor, or the receptionist might make an appointment for you. Your goal for this phone call is to get an appointment booked, so doing it through the receptionist will save you some time. Ask your questions when you meet with your potential financial advisor, and write down how you feel about the answers. Ask her whether she has any questions for you. Answer with as much detail as possible, even if that requires giving in-depth information about your financial situation. Near the end of the meeting, ask the advisor whether she would put together a simple mock proposal for you to review. There is no magic formula for making a decision. Go with the advisor who seemed the most knowledgeable and gave you the best vibe. Phone that advisor back informing her of your decision, and make a new appointment to discuss your needs at length.